BUSINESS SELECTTM PACK. For 12 mos. w/24-mo. agmt. after autopay discount. $66.99 in months 14-25 (subject to change). *ALL DIRECTV OFFERS REQUIRE 24-MO TV AGREEMENT. EARLY CANCELLATION FEE OF UP TO $20/MO. FOR EACH MONTH REMAINING ON AGMT. ADD’L FEES APPLY. Price is after a $10/mo. Auto Bill Pay discount for 24 mos. New approved commercial customers only. Credit card req’d (except MA & PA). Pricing based on Estimated Viewing Occupancy (EVO) for select packages. Regional Sports Network fee (RSN) applies in certain markets. Public Viewing Package offers start at $29.99/mo*. BUSINESS SELECT™ PACK: $29.99 Plus taxes. For 24 mos. w/24-mo. agmt. after Auto Bill Pay discount. 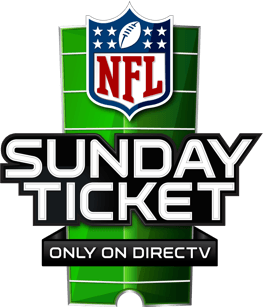 Why is NFL SUNDAY TICKET a good business investment? You’ll start seeing familiar faces frequent your business. Your business will be the place for customers to watch out-of-network games. You’ll see a positive impact on your bottom line. For offices, shops & services: Get 2019 NFL SUNDAY TICKET included with specific packages at no extra cost. NFL SUNDAY TICKET subscription renews automatically each season at then prevailing rate (currently $585/ Business Viewing; and $475/Private Viewing) unless canceled or changed by customer prior to the start of the season. Entertain your employees and customers with entertainment in break rooms, offices, and conference rooms. Keep your customers happy by offering them a way to catch the big game in your restaurant or bar. Restaurants, coffee shops, bars, and lounges can all benefit from a DIRECTV entertainment subscription. In fact, 93% of bar and restaurant subscribers agree that adding DIRECTV to their business has been a good decision+. Offering in-house entertainment in the form of a DIRECTV package is a great way to create regular customers who want to come back to view sports and events. +Based on a January 2018 national survey of bars and restaurants that expressed an opinion. No one likes to wait. But the wait can seem less daunting when there is something to distract customers. Waiting rooms, bank lobbies, and health clubs are all places people gather to kill time. Give your customers a way to pass the time with a DIRECTV entertainment package. Take their mind off the wait and get them engaged with sports, news, or the latest popular shows. Outfit your business’ waiting room with over 140 channels with the BUSINESS XTRA PACK from DIRECTV starting at $64.99 per month++. ++Plus taxes. Auto Bill Pay req'd. For 12 mos w/ 24 mo. agmt. $111.99/mo. in months 13-24 (subject to change). ALL DIRECTV OFFERES REQUIRE 24-MO. TV AGREEMENT, EARLY CANCELLATION FEE OF $20/MO. FOR EACH MONTH REMAINING ON AGMT. AND ADD'L FEES APPLY. New approved commercial customers only. Credit card req'd (except MA & PA). Pricing based on Estimated Viewing Occupancy (EVO) for select packages. Regional Sports fee may apply in certain markets. Just because someone is at work doesn’t mean they don’t need a distraction every once and a while. Keep employees informed and entertained in break rooms, conference rooms, and office lobbies the BUSINESS ENTERTAINMENT™ PACK from DIRECTV. Employees will enjoy over 90 channels, starting at just $44.99 per month***. It beats gathering around the water cooler to trade the latest gossip. And who knows, employees might just learn something! ***Plus taxes. Auto Bill Pay req'd. For 12 mos w/ 24 mo. agmt. $84.99/mo. in months 13-24 (subject to change). ALL DIRECTV OFFERES REQUIRE 24-MO. TV AGREEMENT, EARLY CANCELLATION FEE OF $20/MO. FOR EACH MONTH REMAINING ON AGMT. AND ADD'L FEES APPLY. New approved commercial customers only. Credit card req'd (except MA & PA). Pricing based on Estimated Viewing Occupancy (EVO) for select packages. Regional Sports fee may apply in certain markets. The ultimate experience doesn’t end there. Now you can see what’s playing, surf channels, and view content on any TV with your iPad® or Android® tablet. Help sports fans find you. Draw customers to your business with DIRECTV Sports Bar Finder app for iPhone® and Android. Music Choice Channels let you play the commercial-free music your customers love without any additional licensing fees.